The male swimmer is believed to have suffered a back injury while jumping off 30 foot cliffs into the water. Swimmer being airlifted to safety. 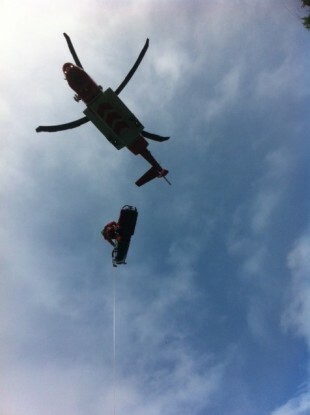 A SWIMMER who was injured after jumping off rocks at Balsadden in Howth today was airlifted to hospital. The Irish Coast Guard emergency operations centre received calls about the swimmer and the cliff rescue team at Howth arrived at the scene and began to administer medical treatment to the man. Further medical assistance arrived with Dublin Fire Brigade paramedics from Kilbarack, with the two agencies working together to stabilise the patient. The coast guard helicopter from Dublin Airport, Rescue 116, arrived and winched the casualty up and evacuated him to hospital. The coast guard said in a statement that jumping off high structures like bridges or cliffs into the water “is jumping into the unknown with tides changing and unknown debris beneath the surface. There is risk of serious injury or worse”. Email “Swimmer injured after jumping off rocks in Howth ”. Feedback on “Swimmer injured after jumping off rocks in Howth ”.